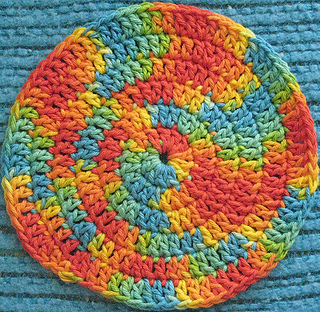 Double crochet stitches give this spiral hotpad an unusual look. The sample uses Peaches & Creme Mar-di-Gras yarn leftover from a knit dishcloth. It turned out better than I expected, and so I decided to add it to Ravelry. The pattern comes from my crochet blog. The pattern link page has very detailed instructions and pictures on how to make the hotpad.